We do a lot of posts of our favorite things and they’re very often things you can find at Target and Amazon. I’m not even going to pretend like I don’t love places like that, but I’m also a huge fan of small shops with handmade goods. Because I don’t sew, knit, crochet, or do a whole lot of crafting, I am an Etsy junkie (quite literally the time I was 8 1/2 months pregnant, took an Ambien per my doctor’s orders, and woke up to $300 worth of baby-related Etsy purchases the next morning. Shared that story before, but really. It needs to be shared again.) I can’t even come close to sharing all of my favorite Etsy shops today, but hopefully I can highlight more of them in the future. 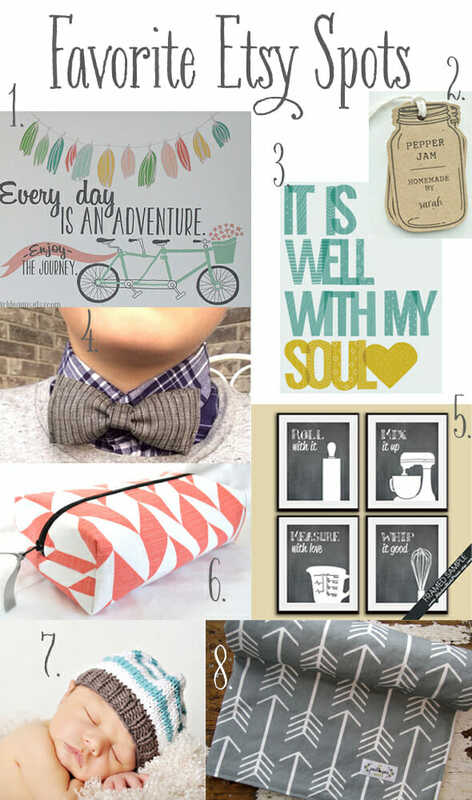 But for today, here are 8 of my favorite shops to follow! 1. Katy Girl Designs. I ordered my Christmas cards from Katy last year and I loved them. She was fantastic to work with and her designs were exactly what I was looking for. She doesn’t just do cards, she has tons of adorable prints available in her shop right now. 2. Print Smitten. I love her designs and specialty items, especially the little tags; they’re perfect for special occasions when you want to add a little something special to your gift, party, or craft cupboard where you sometimes put things and forget about them until you clear them out 3 years later. Just me? Okay, then, moving on. 3. Texture Design Co. I have, like, 10 of the designs from this shop in my Etsy shopping cart and then I get overwhelmed and shut it down and eat a marshmallow (because that’s how I cope with overwhelming feelings, even if I’m being overwhelmed by adorableness.) I love what she does. I want it all. 4. Mark It with a Q. 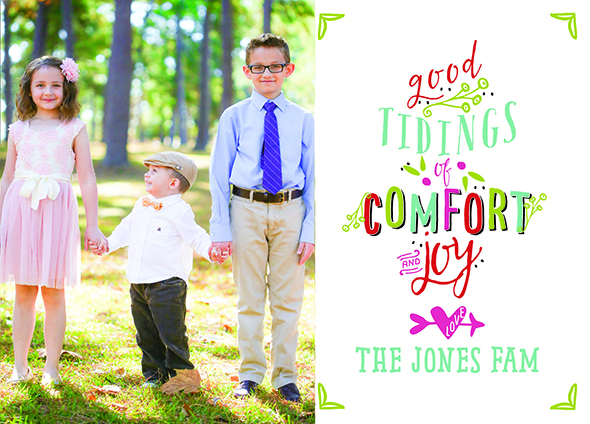 If anyone has seen my 2-year-old on Sundays (and now you all have because that picture of him in the Christmas card was snapped on the way to church one Sunday morning), you’ll know he’s quite dapper. He loves his hats and bowties. I have a handful of bowties I got from Mark It with a Q and we love them. They’re old-school and perfect. I also love them because they clip on, so he doesn’t have to have something around his neck. We’ve tried that and it has not gone over well. He may like ties, but he’s still 2. 5. Kitchen and Bath Prints. If you’re looking for cute/funny prints to hang in your kitchen or bathroom, then you should head over to Falling Leaves Print Shop. Just kidding. Go to the aptly named Kitchen and Bath Prints. They have lots of fun prints (and series of prints) that are perfect for livening up the most lived-in rooms in your house. 6. Candy Argyle Designs. I actually have the joy of knowing Candy in real life; we worked together as sandwich-making robots back when we were both broke college newlyweds. Not only is she hilarious, sweet, smart, and driven (seriously, she worked more jobs than any human I’ve ever known), but she’s an incredibly talented seamstress. Which is good because I am an incredibly un-talented seamstress, so we balance out the universe together. Her bags, her Christmas stockings, everything–they are creative perfection. 7. Treasured by Holly. If you’re not following Holly on Instagram, you should. The hats. The scarves. The everything I would wear everyday if I didn’t live in Louisiana. Also, the baby in that picture? My ovaries can’t take it. They cannot handle babies in hats. 8. Posh Pea Boutique. My youngest has a minky blanket from this shop that has become one of his most treasured objects in the world. Posh Pea and Little Peeps Design (which I would have included, but it looks like she’s taking a break right now–put it on your list of places to check out in the future because her shop has the BEST baby gifts, and when I say “baby gifts,” I mean burp cloths) comprised the bulk of my aforementioned $300 Ambien bender. Her stuff is beautiful and hip and comfy and everything every cool baby dreams of. Just kidding. I’m pretty sure even the coolest babies dream primarily of milk. So those are just some of my favorites, but I want to share more in the future and I also want to hear about your favorite handmade shops (or your own handmade shops!) So leave a comment letting us know where to head so we can check them out! I started an Etsy shop this past summer. I’d love for you to check it out. My friend will also be adding baby stuff. You can follow her on Facebook too. Lemonade Loops is her Facebook page. She’s posted a lot of great pictures on Facebook. Looks like some fun and cute stuff to check out. Thanks! I’m now obsessed with a few new shops. Those are all fantastic! Oh why not plug myself (it’s not something I typically do, haha!). I do watercolor and ink custom paintings as well as sell prints of my series paintings (still working on series 1… a year and a half later, lol). I’ve really enjoyed doing house portraits. I have my FB page which is more about my watercolor work at http://www.facebook.com/SomethingBetsy, but I have a landscape/macro photography side too, so my “almost full” portfolio is at http://www.somethingbetsy.com 🙂 Check me out! For all those doing the OBBFitClub, check out Lexi’s Loft. She makes the cutest and funniest workout tanks. Anders Attic also has the best pillow covers for anyone into Friends, Harry Potter or just cute sayings. Etsy is too much fun to wander through! While you’re on your way, though, check out my sister’s shop. She makes colorful lace earrings and cool things with wood. You have a beautiful family Kate! My sister has a small shop. And it goes along nicely with a food blog because she makes bibs. Better than just another cute bib, these are extra long full coverage bibs. They are perfect for when your babies are just starting to self feed – you know, the stage when theye haven’t quite figured out exactly where their mouths are. These bibs are especially great because they cover the pants as well as the shirt. Sara, and anyone else with a baby, ought to check it out. This is crazy timing that you post this within DAYS of me opening MY Etsy Shop!! myrleeshop.etsy.com It’s not completely filled with everything I’d like yet, but it’s a start! 🙂 Baby #2 is due soon (few weeks! ), so I wanted to start it, but I don’t know how long it will be until I get it to where I want it—maybe never HA HA, prob keep adjusting it! But it’s going to be mostly Kitchen & Kids stuff…My most popular thing is the Stay Put Kitchen Towel (of course all I’ve had time to upload right now is a few Christmas ones…LOL) but they are sweeeeet & so practical for ANYONE! These make GREAT gifts! Thanks so much for the opportunity to share our lil biz with you!! I’d love to do a giveaway and/or discount code sometime if you guys were interested.